Finally got the Z’s new shoes on. Vintage-looking BF Goodrich Radial T/As in size 225/60-14. My dream tire for the car. The slotted mags cleaned up pretty well. The lug nuts still have a good deal of brake dust on them, but those are relatively cheap to replace outright. I also need to get a set of center caps for the wheels. 225-width tires are a lot of meat for a 2350-lb car. They’re about as much tire as can be stuffed on a 7-inch-wide wheel. From what I gather, the tires are made equally with looks and performance in mind (maybe a bit more in the looks department), so they should perform well, if not spectacularly. The picture above illustrates the need for an air dam as well. The front of the car simply looks too light with just the valence. The car most likely needs a drop as well. In fairness, there are no fluids in the engine bay at the moment, nor are there carbs. So that lack of weight accounts for some of the front fender gap. The side rub strips are coming off, too; a gentleman in the local Z club is interested in them. Snapping pictures this afternoon, I realized I hadn’t taken a good clear one of the interior recently. Some issues that need to be addressed include the missing horn pad, cracked dash, cracked center console, tarnished plastic bits, shredded shift boot and ripped driver’s seat bottom. I’ve got a replacement for the latter, but the rest of the stuff will have to be sourced. Next up: Dropping the fuel tank! What joy is mine… Stay tuned. Personally, I agree with the softer spring/heavier sway bar approach to handling for a street car. This gives you a decent ride with a good sharp transition in the curves, while maintaining a moderate amount of weight transfer to help your non-track tires maintain traction. After some experience with the FD on the track I realized that my incredibly stiff springs were overkill for street tires and that, while it handled like a dream, I was losing traction on moderate and slower corners because I simply didn’t have the traction that I needed to take advantage of the track suspension. So after going overkill, I have learned that you need to match your entire setup and make it work specifically for your intended environment and desired vehicle characteristics/handling traits. So what kind of suspension are you thinking of for this beast with only slightly performance oriented tires? Yeah, I agree that an inch or so is the way to go. The good thing about the wheels is that they’ll look good no matter what the ride height is. But a slight drop will be in the cards. 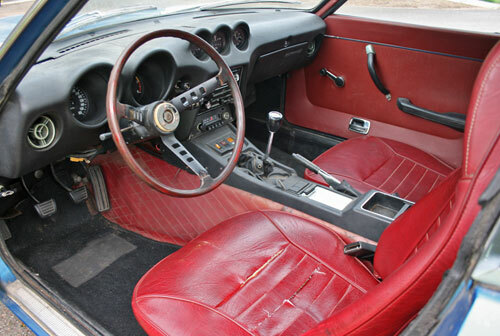 I think your price range is good; there’s a decent aftermarket for early Z’s. I haven’t given any thought to the characteristics of the spring/shock combo… That’s a bit far down the line, so to speak. But I’ll definitely quiz you when the time comes. I do think I want to replace the rubber steering coupler with a stiffer plastic unit, along with some of the bushings. Years ago I borrowed Aaron’s (and then Fuller’s) old FC and never really got over the directness of the steering. I just loved the way it responded telepathically to wheel movements. I’d like to replicate that directness as much as possible with the unassisted rack in the Z, even if that means a bit more harshness. 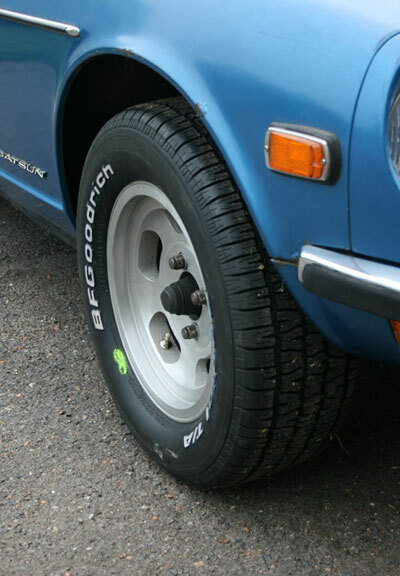 I also need the center cap to my original slotted mag wheels on my 1972 240Z. Where can I buy it? Help! It’s me again: I have a 1972 240Z which came with polished mag wheels with chrome (looking) center caps. These caps are 3 7/4″ diam at the wheel, 1 1/2″ diam at top and 2 1/4″ deep. They are held to the wheel with 4 bolts using an allen wrench which pass through 4 tabs protruding from the cap. I need to replace one but would be happy to replace all four. Any idea where to get them? This search is driving me crazy as I really didn’t think they were so special but I can’t find any caps with the tabs. Most appear to push fit. Any suggestions are appreciated. Hi Matt. Just wanted to you to know you have totally inspired me. I own a 1974 1/2 260 z that I have let deteriorate. It was my everyday driver during college (which is pretty remarkable since I went to FSU from 1998 to 2003, 25 years after the car left the factory). The components of the car are my favorite from each Z. It has the 260’s suspension, the 240’s bumpers, and the 280 engine with flat top L28. I was going to give it to my uncle so it could stay in the family, but he wants to drop a corvette engine in, something I just can’t let happen. Back in 2003, I affixed a custom manifold with a Holley 390 CFM 4 barrel carb, which ran well enough, but never achieved the same zip as the SUs did. I know it was running a bit rich, but I figured rebuilding the Holley with smaller jets would help, but after seeing the condition your SUs came back in, I am tempted to go back to them. I too have the original orange air filter cover. Just wanted to leave a note about what a great job you’re doing. 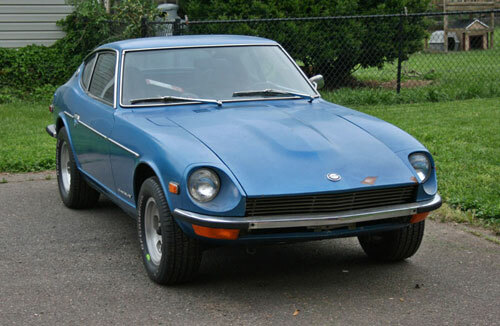 You might have saved two Datsuns by posting this awesome site. Hi Adam. Thanks for commenting! I’m glad my (slow) restoration progress could help to inspire you. 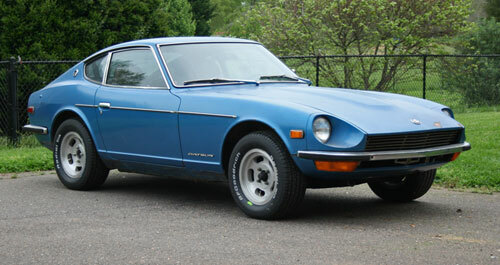 If any cars are worthy restoration candidates, Z Cars are. Hang on to that Z! Early Zs are just going to get rarer and more special as the years roll on. So it has a 240 bumper conversion and an L28? Very cool. In my opinion the Nissan L-series engine and sidedraft carbs (SUs, Mikunis or Webers) are a perfect match. A Holley or downdraft Weber just isn’t the same. Part of the reason is just the nature of the intake manifold—air progresses through the carb and then runs smack into the bottom of the manifold, where it has to make a 90° turn to enter the cylinders. It loses a lot of its energy and some of the fuel drops out of suspension during that turn, which can definitely affect carb performance. I would return to the SUs, as long as you have roundtops and not the (boat anchor) flattops. If you contact ZTherapy, pick up the Just SUs or 240Z Tuneup videos; that’s how I learned how they worked and how to tune them correctly. One last note: If you’re still in Florida, you’re in the middle of one of the most active Z Car communities in the country. The legendary Carl Beck (author of zhome.com and Z restorer) lives in Clearwater and is beyond friendly. I’d get hooked up with a local Z group if you haven’t already. They can sort out whatever issues your Z is having in a heartbeat. Thanks matt. I am actually in Tampa. I’ll definitely get in touch with a club. I think I’m going to start pulling stuff out this weekend so I can see what kind of deterioration has occurred under the rug. Got pretty invasive rusting around the gas fill area and the rocker panels. Roof and pillars are solid. I’ll take some pics later to show you what I’m working with. Great to have another person going through this slow but fulfilling process. Tampa’s a good place to be for Z stuff. Understand about rust—mine’s pretty solid aft of the cabin, but the passenger floor, frame rail and rocker panel are far gone. That’s my biggest challenge with the resto. Would love to see pics. You should start a build thread on one of the Z forums, if you haven’t already. I prefer classiczcars.com. Most of the good folks seem to be there. I’m not very active there (will be more as my resto progresses) , but if you decide to post a thread I’ll definitely comment on it. I have a 1972 240Z which came with polished mag wheels with chrome (looking) center caps. These caps are 3 7/4″ diam at the wheel, 1 1/2″ diam at top and 2 1/4″ deep. They are held to the wheel with 4 bolts using an allen wrench which pass through 4 tabs protruding from the cap. I need to replace one but would be happy to replace all four. Any idea where to get them? Do you know the color code of the car here? Or what color is called, considering a resto myself and it matches the one I had in 1971 and sadly sold in 1973! As far as I know it’s a non-factory shade of blue. My dad had it repainted from its original 901 Silver back in the late ’70s.